Wow where do you come up with this stuff? Its cool anyway,makes you think i have loads of that stuff but there is no way for me to radiate it to people…. I guess if you wanted to sum me up you could say I was on a downward spiral in a bottomless pit in the middle of nowhere. And the only way out is with one bullet…one shot…and it could all be over. Just. Like. That. But if I did that I would only be entering the unknown. Another downward spiral in yet another bottomless pit in the middle of an unknown, non- existing, fucked up, better than the real world shithole with no way out. Now think about this: you are going to be something for eternity. You are going to experience life then something else for ever and ever. And there is nothing you can do about it. You are never going to be able to leave and your never going to be able to come back. You are trapped forever. What if when I die my memory is erased and I start all over again. And I have written this over a billion times and you don’t even know it. An in a way its kinda like what you have just said..i cant put into words how but it just does. melissa i challenge you to a duel!! I’ve been spending a while working out how you have managed that photo with the mirror and reflection… still thinking! today i’ve been in a park with friends. a duel came to me too, about time, lazyness and lost friendship… but the 1982 sentence won over everything: “all those memories will be lost in time… like tears in rain”. Once again, I LOVE your pictures. It’s really interesting what you just wrote. Life is a game of opposites. You could think of it as a struggle between energies, which bring things to be themselves for some time, and then make them “die”, or simply stop being. That’s the way Heidegger explains life…or at least, that’s how I understood what he wrote. I don’t really like him (I think he became a nazi in the 1930’s), but I think those particular thoughts I just mentioned are interesting. I guess energies are within and all around us. We catch and release them all the time, without even knowing it. I think making music is one of the most perfect forms in which people can release their energy. It’s magical to see a couple of musicians get together to make sounds. There are no words to explain what happens then, and that makes me think music is even deeper and more powerful than all languages. I found a couple and I shook at their intensity. I keep saying this all the time, and I’m convinced it’s going to happen some day: I need to be infront of your band, listening to it, embracing its sound, leeting it go through me. I really need it. I might sound crazy, I know. But I’m hypnotized with AdM’s sound. I love music more and more each day. Playing bass takes me to another place. I only hope in time, I can become a better bassist, just to honor music. I keep waiting for your new album. Yes, Opposites are Alike. I see what you are saying. It’s been a point I have argued many times in the past much to my demise. i love using mirrors for self portraits….. you crossed my mind today./. I love your cryptic blogs and lyrics! Regarding Mark’s comment about the reflection and lyric, Denise posted an interesting photo of you on her board–your head is titled back and you are holding a hand held mirror and the camera went up your arm. Hmmm very interesting, both lyric and picture. Makes a mind searching for more opposites and inspiring an eyes to see the world in other, more interesting way. and we have to make a take away. Two nights ago I was in the venue where I met you and got my pic taken with you two years ago. I met another great bassist and human being–Ryan Sinn–formerly of The Distillers and now of Angels & Airwaves. I got my photos taken with him only a few feet from where you and I met. In my case it was a duel betwen the GOOD and EVIL, but now I want to let more place to the good in my life. In each HUMAN their is a part of negative and POSITIVE like the YIN (black) and the YANG (white). Because we have the QUALITIES of our VICES and vice versa. Mirror, MIRROR tell me who’s the most BEAUTIFUL girl of the WORLD ? 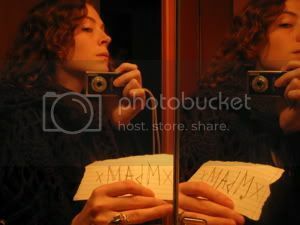 In my quality of mirror; I must say that the most beautiful girl of the WHOLE WORLD is MELISSA AUF dER MAUR!!! Don’t be afraid PEOPLE, go to visit my BLOG THUNDEREYE, my evil side isn’t enough POWERFUL to bite you from the screen! my mother is coming to visit me on Saturday and my friend Lucy can only say : “…f..k off you d..k..” in Polish, she loves Polish Zubrowka vodka ( with a blade of our bison’s favourite grass), my mother doesn’t drink at all, maybe it is not to late to get started(she’s 63)? What to do mirror mirror dear oh dear ??? any adivice? – direct to : outofseason@o2.pl an many thanks. you write things that are light yet have this kinda heavy effect, i think it’s pretty rare, i dig your music, can give me a tip on how to go about producing mine? All I Desire Is Something To Fill Up The Nothing Inside Me. But Yet I Want It So Bad. I Don’t Know What I Would Do With This Something. the big one – life v death is something i became obsessed with at the age of 14 (joy division & the smiths were strangely uplifting for me in those days). my poor pa had to deal with constant questions about the meaning of life. thankfully i discovered my soul mate before i did an ian curtis and found balance and a meaning for life – love of living with the one i love. love morrissey’s new album by the way – track six is my favourite (extremely confronting and wonderful use of words). the pic is fascinating – challenges my lazy sunday evening mind. you are a true creative princess xMAdMx. I want you to hate me, so you can love me when the time is right… I can’t stop loving you though! and through that process of enhanced sensitivity the truths of our universe is explored through each and every one of us. First i want to thanks Dorota for the new name that i will sign now at the end to each of my texts. Yes, Melissa’s face is beautiful! Dorota the worst thing that you can lost is yourself…and you’re a little TEASE because your E-mail address is failed. YOU must be lost little girl!!! …it is not! my mail is not broken at all! it is outofseason@o2.pl …and it is fine…you can try again if you can, cause you see it is not very polite to USE sombody else’s space to…to what the hell! Melissa, do you mind? … No? I thought so :), I couldn’t find your new cd, so I bought Laurie Anderson’s “big science”, my niece love my bass&sonic youth’s “tunic” song from “goo” album… she is 13 and her favourite game is playing with her paper dolls, she’s got 100 of then maybe more and she knows every single nameof them and to wich(how2spell it?looks to german my ‘wich’, and on laurie’s they talking german right now, how bizzare! ) family they belong…when I move out and will move into proper house with internet access I will show you all of them! to all of you! they so cool! some are really ugly, some of them had legs amputated and she had to draw another one&selotaped it!one of them was eaten by Edi(the cat -)- bless her paper heart!one of them got lost&olivia was crying&couldn’t sleep for whole night(little amanda)but she found her in the end! oh boy! paper circus! about losing yourself! come on! it is beautiful to be carried away in a good way, but true you have to know you way back to yourself! fee fa fo fun for me! “…Listen,uh – I just want to say thanks. So…thanks. Thanks fot all the presents.Thanks for introducing me to the Chief. Thanks for putting me on the feedback. Thanks for going all out. I-I feel- I feel like – I am – in a burning buliding- and I gotta go. My goal wasn’t ever to be impolite with you, ma ravissante Déesse, and with nobody neither. I just want to have FUN! I’m happy to see that Dorota have a good sense of humour too. I have a nice nephew me too,he loves music of Simple plan and lullabies (he’s just 3). Cause i’m a gentleman not a swine! I’m travelling in my head… strange are some girls of L.A., don’t you think MELISSA. But everybody and i love theirs eccentric creative side. So, see you later lovely aligator! XpeaceX dorota-Wizard of Oz- Haaha! Where is the bridge between harmony and dissonance, Melissa? It must have eroded with all the many crossings I’d say. hey Melissa. I hope you know you’re really beautiful. 🙂 that duel-list you made is really interesting, makes me think wich one of the words fits me the most. sad to admit that I’m more lazy then brave, heh. bought your cd just yesterday, and I love it. you’re just amazing. wish you all the luck, keep on rocking! can’t wait to hear your new work. Where is the line drawn between love and obsession? Does anyone know when the new album will be released? 17th of July. No photography day. At least in Brighton. Hi Melissa: I love your music, your first album is beatiful, and your pictures is amazing. Bye Bye. Chris from Buenos Aires, Argentina. Thank you so much for your beatiful songs!! !